Hey, make sure you go out this weekend and pick up a bottle of wine with a pretty lable for Wine Blogging Wednesday 16, hosted by Derrick of An Obsession With Food. And, because innovation is always a good thing, this time around Flickr users an post their pictures in the Wine Blogging Wednesday 16 Flickr pool (thanks Joe & Lori). Flickr users and regular bloggers alike should add a wbw16 tag to your photos and your post, if you can (thanks Sam). Cheers everybody and we'll see you next week. November 17th has become a bit of a wine holiday in America. Every year, the third Thursday in November means that Beaujolais Nouveau hits wine shop shelves and, to many, this marks the beginning of the holiday season. In reality, this “event” is much more hype than holiday. In fact, it can be considered the Valentine’s Day of the wine world – an occasion created largely by marketing and advertising. Beaujolais Nouveau is made from Gamay grapes and is sold a few months after harvest, making it the first red wine many of us taste from any given vintage. And while 2005 was a particularly good year for Gamay in France, it’s not a serious or complicated wine. Its flavors are simple and while it has its place (it’s a great wine for turning white wine drinkers into red ones) it really doesn’t deserve all the fanfare. Long Island has its own super-fresh wine, but it’s not made from Gamay grapes. In fact, it’s not even a red wine. 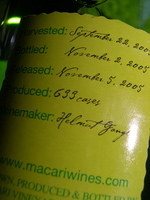 This year Macari Vineyards picked Chardonnay grapes on September 22, the wine made from the grapes was bottled on November 2, and it was released on November 5. The vineyard calls it “Early Wine” and it’s made in the style of young whites in Austria. This makes sense because the wine’s maker, Helmut Gangl, was born there. 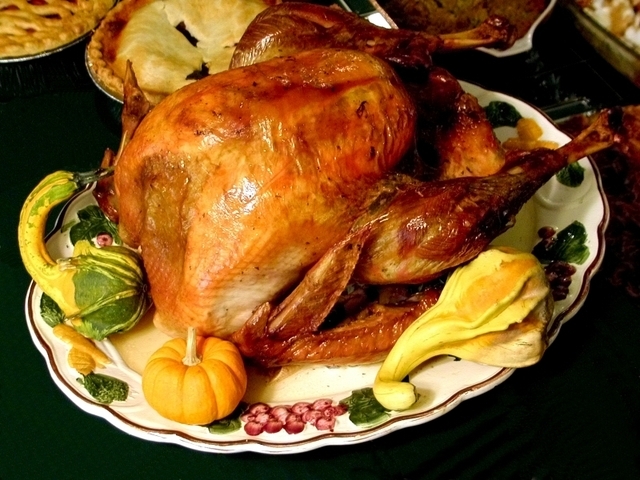 Because of its focus on food, friends and family (not to mention its post-harvest timing) Thanksgiving is often cited as a favorite holiday by local winery owners and winemakers. Each and every year, readers of magazines and newspapers are inundated with wine pairing advice and suggestions for Thanksgiving dinner. This year, instead of offering advice, I decided to ask people in our own local wine industry what foods they were eating and what wines they’d be drinking this year on Thanksgiving. Here are the results. 'm a little behind in my participation with Beau's latest meme: The Gift of Wine. First I was insanely busy with my day job. Then was on deadline for a couple freelance pieces. To make matters even worse, we were without Internet access two days last week before heading home to Pittsburgh for Turkey Day. But, I'm back and it's time to catch up. Beau's question is: If you were to give a wine out of your own cellar/collection/shelf/fridge as a gift this year, which wine would it be, who would receive it and why? This one is easy...I'd give my last bottle of 1991 Cuvee RD sparkling wine from The Lenz Winery to my aunt, Pam. Why? That's also easy, but multi-faceted. First, she is the woman most responsible for starting my wine addiction. Back in college, when I was drinking mostly beer and cheap (real cheap) booze, she'd always introduce wine into my life on holidays. When I took interest, my Xmas gift each year became a mixed case of vino -- to help me explore different regions and price points. Secondly, she just got engaged, and what better way is there to celebrate any occasion than with a bottle of bubbly. I've taken this meme one step further...I actually DID bring this bottle to her house on Thanksgiving Day and we toasted her engagement to Randy and enjoyed the wine as a family. Let's see...who should I pass this along to? And maybe Ali at Something So Clever would like to join the meme as well! Despite my love of New York wines, I rarely find myself eagerly anticipating a new wine's release -- partially because I don't always know the release schedules and partially because many wineries only release new wines once the previous vintage sells out. I'm not up on their invetory, so I just don't know. Every fall, right around this time, I do find myself clamoring for the new "Early Wine" from Macari Vineyards. I really enjoyed last year's vintage and it's a favorite wine in the LENNDEVOURS household within the first few months of its release. The racy acidity seems to fade much beyond that so it loses a lot of it's charm. 2005, as you've no doubt read here, was a tremendous growing season...hot, dry and sunny. And, because 90% of the Island's white wine grapes were picked before the monsoons, this wine was unaffected by the 17 or so inches that were dumped on local vineyards at harvest time. That ripeness is apparent, but I think may I prefer this wine during less-ideal growing seasons. The grapes for this bottling were picked on September 22, the finished wine (made 100% from chardonnay in steel tanks) was bottled November 2 and the wine was released November 5. Think of it as Long Island's white wine rendition of Beaujolais Nouveau...but with some character and without the banana scents/flavors. This is a wine, not a marketing blitz. Read it again. 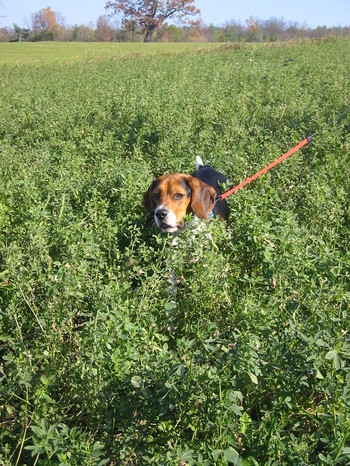 We’re talking about terroir -- you know, that French term? Believe it or not there is actually a debate going on today that asks if terroir really exists. I used to find this astonishing since after all, isn’t wine all about where it's grown? Isn’t that why we have thousands of different wines to choose from in the stores and restaurants? If terroir didn’t exist, what would any region have over any other? Wouldn’t it be better just to consolidate all the winemaking in one part of the world, cut expenses and take it from there? Wouldn’t you just want to drink Jack Daniels or Grey Goose -- the same products made to the exact same specifications year after year? That’s before I finally realized how this argument started to develop. Its because of a type of product that has become all the rage lately and is produced almost everywhere in the wine world. I call them WMVs -- Wines of Mass Vinification. No not those!. These can actually be found in any wine shop (or, if you live outside of New York State -- gas station, grocery store, convenience or state store) you walk into. WMVs are wines made without any respect to terroir. They are typically produced in large quantities, totally by machine and rarely touch anyone’s lips during the winemaking process. Many “wineries” try to actually produce them with the exact same flavor components every single year. They can do this by utilizing gas chromatography, spectrometry and flavor profile analysis. Being a winemaker for a WMV means looking at lot of charts and lab analysis to determine how your wine is going to taste. In my never-ending quest to bring you, my readers, the best and most comprehensive information on the New York wine world, I've decided to invite some of the industry's best and brightest to join me as regular contributors here at LENNDEVOURS. This Thanksgiving, I have a little something extra to be thankful for as Richard Olsen-Harbich, managing director and winemaker at Raphael has agreed to sign on as LENNDEVOURS' first contributing columnist. Richard has been a part of the Long Island wine industry since 1981 and has been a leader in establishing regional identity and vinification techniques for the region. A graduate of Cornell University, he worked to establish Long Island’s second commercial winery in Bridgehampton (now defunct), where he was among the first to market Long Island wines to Manhattan and its residents. Over the past 25 years he assisted in implementing many pioneering techniques for Long Island vineyards such as permanent cover crops, high-density spacing, low-wire trellising, soil pH management and varietal selection while winning hundreds of awards and accolades for his wines. In his role at at Raphael, he has developed the first Bordeaux/Long Island consultation partnership and has been a leader in the use of hands-on, artisanal winemaking techniques in the region. Richard is also the author of all three federally recognized Long Island American Viticultural Areas (AVAs). Please join me in welcoming Richard to the LENNDEVOURS team, and watch for his first post which will appear later today. Everyone's favorite food-obsessed blogger, Derrick, has finally found the time to recount the first day of the Schneider's recent culinary quest (vacation), which he's dubbed the OWF "Eat 'Til You Drop" Tour. As you can see, the LENNDEVOURS tour service was in full swing (and I gladly took the day off work) as we visited three of the five places I had intended to take them. Note to anyone taking these two on a wine trip: Even if they are sick and have trouble tasting, they do NOT have trouble talking...and talking...and talking (just kidding guys) In all honesty, their already vast (and impressive hunger for) knowledge made them damn near perfect tasting room companions. Here's to many more tasting trips together in the future (yes all you Bay-area bloggers...Nena and I are coming...one of these days...I promise). I'm looking forward to reading about the rest of their trip. I was jealous as Derrick told me of the itinerary while we were at Shinn Estate Vineyards. Food and wine bloggers are really good peeps. On Wednesday, December 14 at 7:00 p.m. Shinn Estate Vineyards will host a winemakers' dinner at the James Beard Foundation. They will be pouring old and new releases, as well as barrel samples that aren't available anywhere else. The dinner will feature the James Beard House debut of chef Ian Boden, who has been retooling the menu Home for the last six months and is excited about this unique opportunity to cook at the Beard House. His "All North Fork" feast menu looks absolutely amazing. Tickets are $100 for members and $125 for non-members. 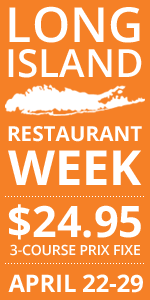 Call 212-627-2308 for reservations. Visit the James Beard website to check out the complete menu. The Seneca Lake Wine Trail has named Paul Thomas, a graduate of Cornell University and a long time Finger Lakes resident, as its new executive director. He has been working in the position on an interim basis since the summer when the previous director, Barbara Adams, passed away. 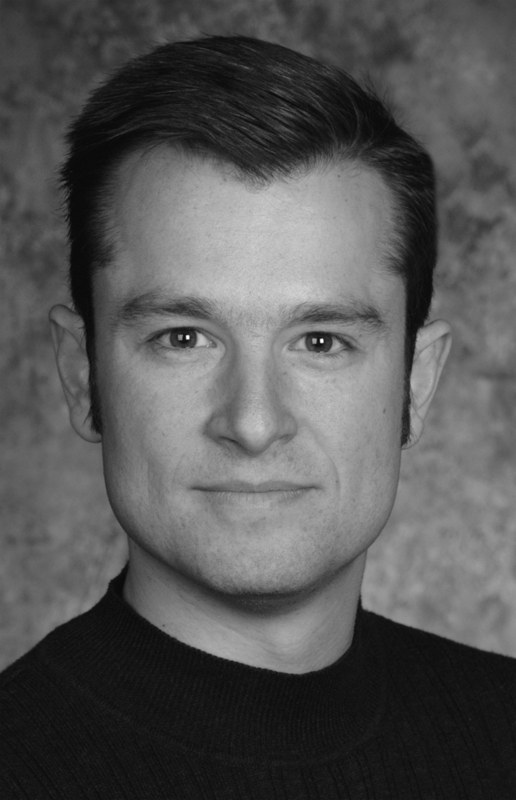 Thomas brings a background in marketing and communications to the wine trail and in the past has served as director of communications for both the Goleta Valley Chamber of Commerce in California and the Corning Area Chamber of Commerce in New York. He was also the former Assistant Vice President of Product Development of Bonanza.com, based in Dallas, Texas. "Paul has a terrific 'outside the box' approach that comes to the Trail at a time when creative thinking is necessary," said Ted Marks, President of the Seneca Lake Wine Trail and owner of Atwater Estate Vineyards. "Paul has shown himself to be a shrewd marketer for as long as I've known him. Despite the challenges we face, we are all confident in Paul's ability to help us keep bringing more and more visitors to our wineries and all area businesses." 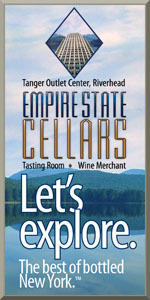 For more information about the Seneca Lake Wine Trail, visit www.senecalakewine.com. 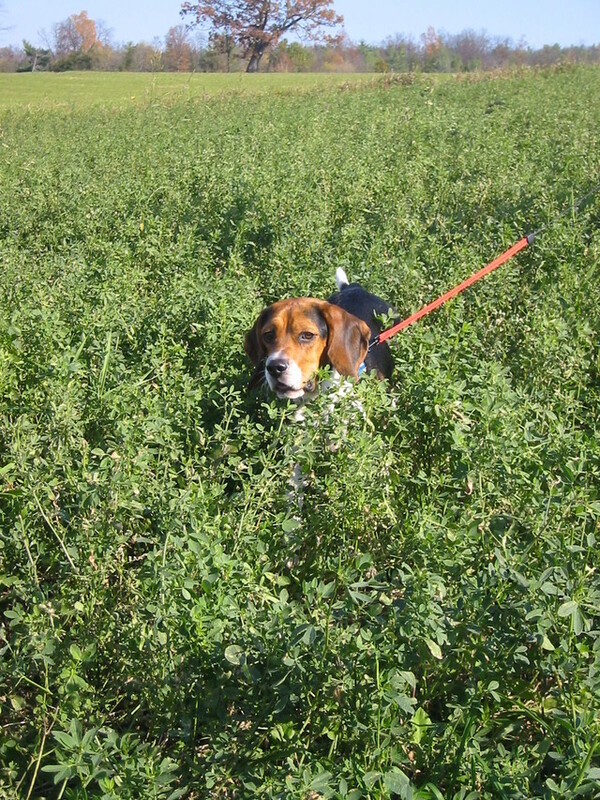 Ben is a world-reknowned alfalfa field explorer...I bet you didn't know that. Winemaker Richard Olsen-Harbich also crafts one of the better sauvignon blancs around, but he's told me before that only having the one white (and it's not chardonnay!) wine has turned some tasting room visitors off. 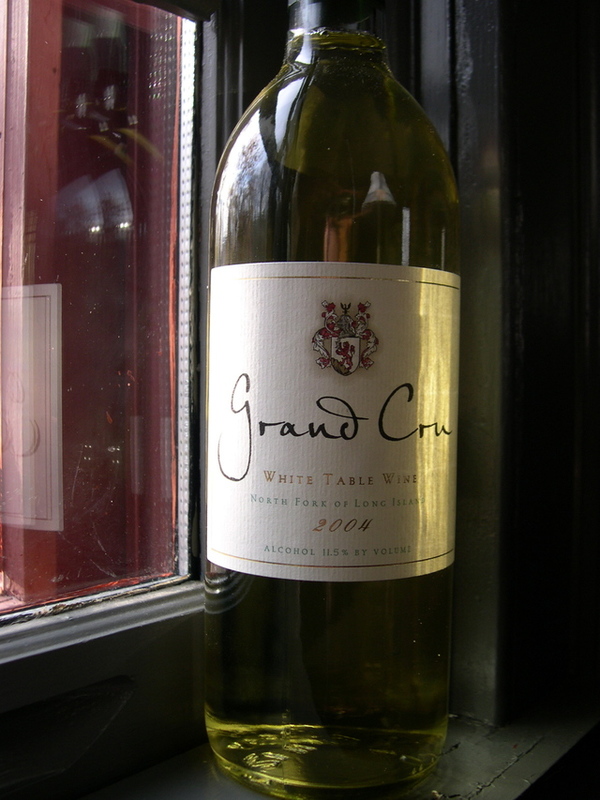 There is no doubt in my mind that their latest white release, a 2004 Grand Cru White Table Wine ($15) was conceptualized to cater to those white wine wanters. It's 100% chardonnay from nearby Ospreys' Dominion Vineyard and made 100% in stainless steel, which just happens to be a local style of chardonnay that I really enjoy. Why call it Grand Cru and not chardonnay? It's much more about avoiding any chardonnay bias than playing on the reputation of French Grand Crus. If they were going to do that, they'd probably have called it Chablis. This is chardonnay, but not in the usual American oaky/buttery sense. Again, this is a wine made for the people and thankfully, fewer and fewer people want that style of over-manipulated chardonnay. Tongue: This wine is relatively light bodied and offers nice, fresh acidity. The flavors match the nose with a slightly mineral finish. Clean, crisp and easy to drink there's not much complexity here, but there doesn't need to be. Very food friendly and again, in a style I relish. Comments: Would be superb at $12, but not bad at $15. If you don't think you like chardonnay, come to Long Island and I'll let you actually taste the chardonnay grape. There are at least a half dozen stainless or mostly-stainless made versions here now...and you can actually taste fruit. Imagine that. Napa is invading the North Fork! Napa-based Pine Ridge Vinery has purchased both Broadfields Wine Cellars (along with both Tasting Room locations) and Charles John Vineyard, both on Long Island's North Fork. Both of the recently sold properties have released estate-grown wines I've enjoyed in the past (1|2) so I'm excited to see what Pine Ridge does with the fruit and what their plans are for their presence in the region. Let's just hope that they don't try to make Napa-style wines here, because it just won't work. As Theresa Dilworth points out in the Newsday story, they could have bought vines anywhere, but chose to set up shop here on Long Island. If I had to guess, I'd say they are going to be very happy with their choice. More on this news soon. I swear to you that I'm not stalking Stephen -- he just makes such awesome dishes that I check his blog several times a day just in case he posts more than once recipe. Anyway...today I got a special surprise -- he paired his latest creation with Macari Vineyards 2003 Cabernet Franc. Of course, I was with Beau when he got a few bottles of the wine to share with wine bloggers as part of his revolution, but I didn't know how quickly the reviews would start rolling in. I've got a couple bottles of this terroir-tastic red (and a couple other upcoming Macari releases) in my "for review" queue...which I may have to dive into this weekend. Macari Vineyards makes some great wine...check them out. Have you ever found yourself staring at a wall of wine at th wine shop, with no idea what you should by? Subconsciously or not, a wines label often jumps out at us all in that situation and affects our buying decision. I hate to admit it, but it's happened to me to. (And the opposite is true, Nena and I often comment on the bad labels we see). Of course we know better -- pretty labels often hide ugly wines -- but we're human and wineries put a lot of money and time into designing labels that will make us buy. Well for Wine Blogging Wednesday #16 the obsessed one himself, Derrick of An Obsession With Food, is asking us to defy logic and surrender to label designs. That's right, he wants us to Judge a Bottle by its Cover. Now, if you know Derrick at all (or just read his blog) it might be a surprise that he chose this theme on his own. But, Derrick is always one to challenge us and our pre-conceived notions and as he said to me a few weeks ago "I didn't define what a pretty label is...it's totally up to the individual." So go out there...find a bottle with a pretty label (to you) and join us on December 7th. 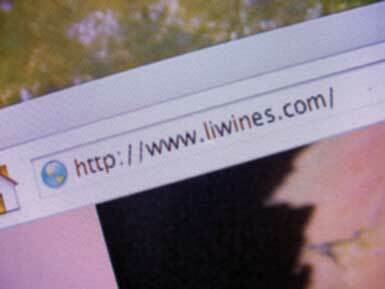 I've just stumbled up on the Finger Lakes Weekend Wino blog and it's a site that I plan to keep an eye on. I'm always interested in learning more about Finger Lakes wineries and wines...and with a definitely lean toward wine value, this new blog should be an interesting read in the sometimes-expensive NY wine world. 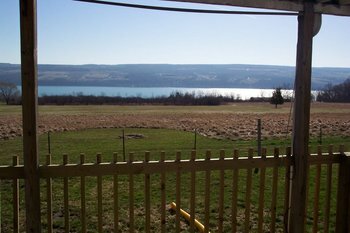 The picture above is the view from their vacation home in the Finger Lakes (not sure which one). Hard to beat that, huh? Fatemah has begun the always-daunting task of writing the round-up for Wine Blogging Wednesday #15. Take a look and learn about some new wines you've probably not seen or heard of. And keep an eye out for the annoucement for WBW #16, which is hosted by one of Fatemah's neighbors! Several of Long Island’s smallest wine producers are Negociants. Negociants buy grapes from a local grower, then make, age, blend and bottle wine under their own label. This practice is common in many wine-producing regions, particularly in Burgundy, home to many well-known negoicant labels like Louis Jadot and Duboeuf. It’s an attractive endeavor to many winemakers because it can be difficult, from a financial perspective, to plant/grow/maintain a vineyard as well as buy all equipment necessary to make and bottle a finished wine. In the United States, negociant-made wines have the words “produced and bottled by” on the label, which indicate that at least the fermentation and subsequent production was done by the producer or company. If you see “estate bottled,” that means that the grapes were grown, fermented, and the wine bottled on the owner’s property. Phrases such as “cellared and bottled by” or “made and bottled by” are fundamentally meaningless. 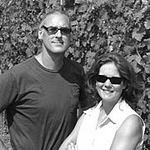 Schneider Vineyards, founded in 1994 by Bruce and Christiane Schneider, has operated as a negociant since its inception, buying grapes from growers on the North Fork. 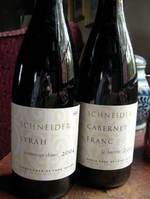 Their first wines were released in 1997 and were quite popular among wine drinkers and wine critics alike. 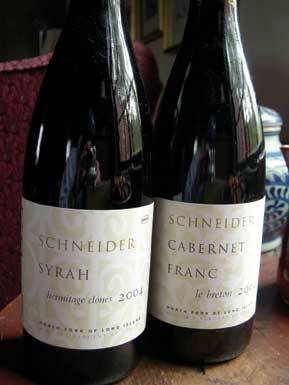 Then, in 2000, the Schneiders planted their own 22-acre estate vineyard on Roanoke Avenue in Riverhead and the first wines made from 100-percent estate-grown grapes were released just a few weeks ago. 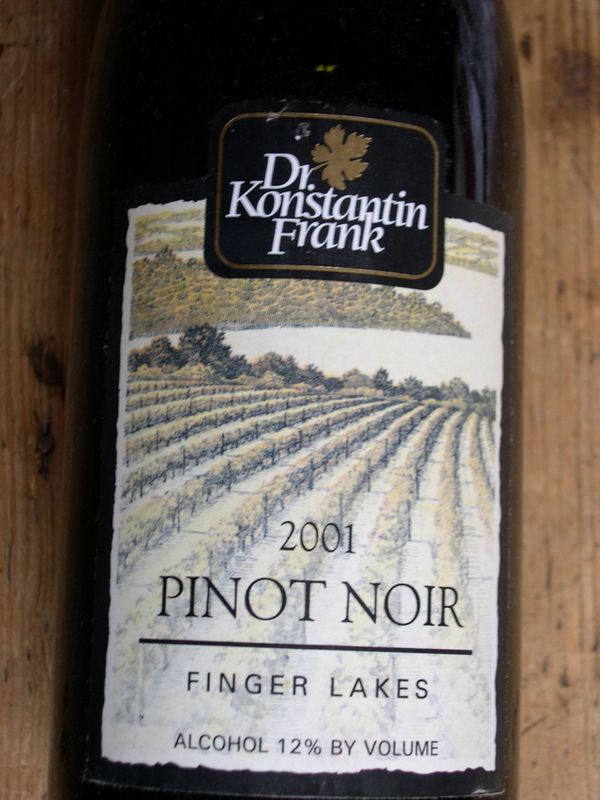 Dr. Konstantin Frank Wine Cellars, on Keuka Lake in New York's Finger Lakes region is well known for it's riesling. In fact, some say that their dry riesling is among the best (if not the best) riesling in the U.S. But what about the reds? I'd never tasted any Dr. Frank reds until I opened this bottle last weekend. My hopes weren't overly high because I tend not to like Finger Lakes reds -- they always taste green and vegetal to me. This one, however, I liked quite a bit. Tongue: Medium bodied with good acidity. There are some tannins, but they are soft and well incorporated. Definitely more earthy than fruity (a good thing). 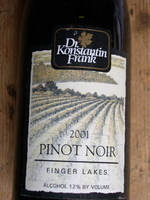 Overall: This makes two Finger Lakes pinot noirs that I've liked. I look forward to trying more of them and reviewing them. This would be great with fall foods. Stephen Cooks is a fairly new member of my "check it daily" food blogger list. He comes up with some spectacular recipes and he always has great pictures of the final product. 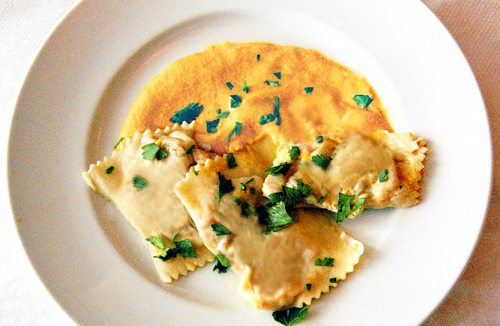 And this week, he offers up an awesome-looking way to get rid of those carving party scraps -- pumpkin parmesan ravioli with pumpkin cream sauce. Fatemah said 250 cases with bonus points for a producer under 1000 cases per year. I drink a lot of wines from small, local producers (but then, you already know that). But I wanted to fine the smallest production wine I could. I think I've accomplished just that. The numbers on Waters Crest Winery 2001 Meritage? 50 cases were made. 186 cases total winery production that year. As much as I hate the fact that they call it "Champagne," this month Pindar Vineyards is offering tours every weekend that offer an inside look into the making of their (quite good) sparkling wine. Light nibbles and a complimentary taste of the finished bubbly are included. Admission is free. 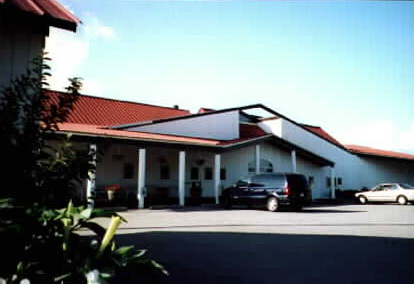 Visit their website or call 631-734-7100 for more information. 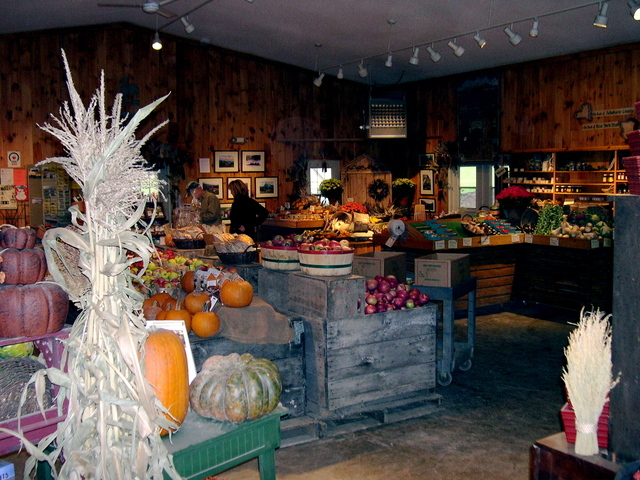 Schoharie Valley Farms -- "The Carrot Barn"
Nena and her sister both worked at the Carrot Barn growing up and with such a place in town, there's little need to buy produce at the grocery store. Local vegetables, potatoes, berries and apples are the main draw (for me anyway), with flowers, baked goods and country gifts in abundance as well. Last Saturday, we headed down to the Carrot Barn once again...this time to pick out pumpkins for the annual Wine and Pumpkin Party, and to have breakfast.